Spain did this wonder, cant we do it too ? Typical solar power plants stop working when the sun sets, but a new one in southern Spain, called Gema solar, can stay awake all night. "During the day we capture the energy of the sun and we store that energy into a tank," said Santiago Arias, a mechanical engineer who helped put Gemasolar into operation. "Then, whenever we want, regardless if it is day or night, we convert that energy into electricity." 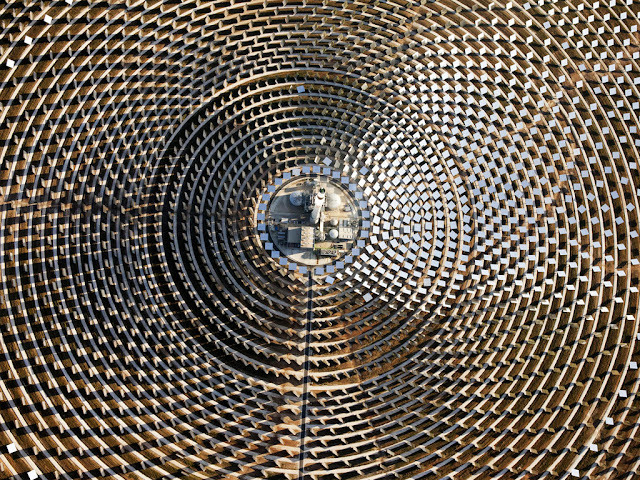 Located just outside the quaint village of Fuentes de Andaluc�a, Gemasolar bills itself as the world's first commercial-scale concentrated solar power plant (CSP) that uses molten salts receiver technology. 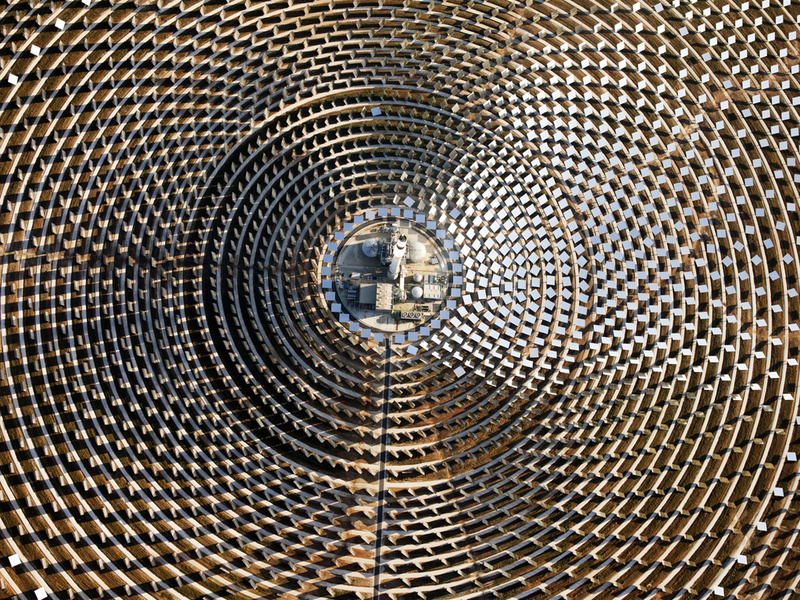 2,650 large mirrors called heliostats direct the suns rays to a receiver at the top of Gemasolar's 450-feet tower that shines like a beacon during the day. 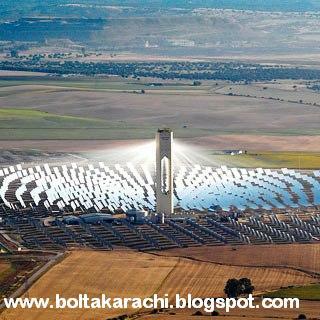 The stored energy can generate electricity for 15 hours without the sun shining and according to Arias the plant can provide 19.9MW of power, enough for a town of about 100,000 people. From the receiver the salts are heated to enormous temperatures; around 250 to 300 degrees Celsius when it's considered relatively cool, but when the molten liquid is pumped up the tower to soak up the sun's heat directed to the receiver, the temperatures exceed 500 degrees Celsius. Those energy-storing salts are a combination of 60% sodium nitrate and 40% potassium nitrate and are so hot that they are always in a liquid form. According to Arias each pound or kilogram of molten salt is able to store up to three times the amount of energy that can be stored in oil, an energy-store that is used at other CSP power plants. At twilight, the plants heliostats are rotated into a horizontal position, as if to get a night's rest, but the remainder of this solar plant keeps working. When the salts cool, they release energy that is used to produce steam, which turns turbines and generates electricity that is transferred to a general grid hookup at the plant. The $325 million plant began production last May and is a joint venture, between the Spanish engineering and construction firm Sener that owns 60% and investment partners from Abu Dhabi's Masdar energy company. The official inauguration is set for October 4, due to be led by Spain's King Juan Carlos and Abu Dhabi Crown Prince Sheikh Mohammed bin Zayed Al Nahyan. 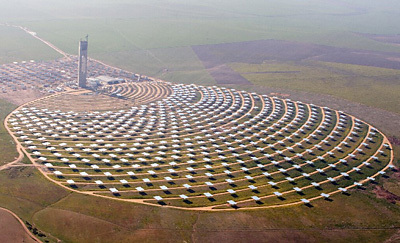 By the end of 2012 Gemasolar expect to reach 70% of full capacity. That, says the owners, is a rate of producing electricity comparable to conventional power plants and a rate they hope will make the plant very competitive. 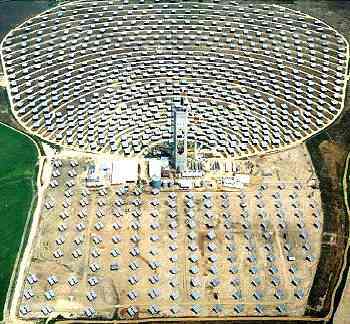 However this plant, and Spain's solar industry, still gets government price subsidies for the electricity it sells. "Our vision is that those subsidies will disappear soon," Arias said. "By constructing plants we are reducing the cost. At the same time, the gas prices, the oil prices, we are sure that they will go up, so there will be a certain time that we don't need any subsidy at all." Arias can't say exactly when, but he's sure this commercial-scale solar plant providing electricity around the clock will help.